Best option available for mom's on the go! This Medela model is my hands down favorite pump after experimenting with several models. It is lightweight and so efficient, portable, quiet and the battery life is outstanding! Expensive, yes. Worth the money, definitely. This is a must add to every baby shower registry for any expecting mommy! I love this breastpump. With my daughter I was only able to breastfeed for a few weeks due to her not latching on. And despite trying with a pump I couldnt get enough out. This time around with my son, who is 3and a half months, I got a medela freestyle pump. I use it every chance I get. When he is eating on one side I pump the other. When he is sleeping I pump both. I think being able to do one or both at a time is just fantastic. Its easy enough to use too. Ive been back at work since my son was 5 weeks old and if it wasnt for the fact I have an awesome pump he would be getting formula. I honestly had no idea I would be able to breastfeed for so long. Now im beyond happy and I am planning to go aas long as I can. If you really plan on trying to breastfeed this is definitely the pump for you. Comfort Honestly, I et myself up however and just go. Most of the time I forget im even pumping. I definitely cant complain. Ease of Cleaning Easiest pump i have had. Just a few pieces to clean and theyre super easy to get apart. how can you beat that? Durability Ive had mine for 3 and a half months and I havent had any problems with it or had to replace any parts. And I use it everyday. Versatility Just awesome. Once you try it you wont regret it. Ease of Use So simple. Turn it on, sit back and let it do the work. Breastfeeding has never been easier. Can't imagine not having this pump! I started using this breast pump almost four years ago after the birth of my first daughter and used it again two years later with my second daughter. I nursed them for fifteen and seventeen months respectively, and I can't imagine not having this pump for that time. I used this pump to help relieve engorgement in the first month as well as to pump and store milk in the freezer. Thankfully, both my girls were able to nurse and take a bottle with breast milk without any trouble, so having the pump really worked to our advantage. I have never used another pump besides one hospital grade one at the hospital after giving birth but I've never had any issues with my Medela. Comfort This makes pumping as gentle as pumping can be. While it's certainly not the most pleasant feeling, this pump is gentle while also being effective. I have been able to turn it up to full power without ever experiencing any blistering or soreness from the pump. Ease of Cleaning I rinse the parts out right away and then put them through the top rack of the dishwasher or in a baby bottle sterilizer. Durability Mine has lasted for almost four years now with pretty heavy use for two kids and I plan to use it with our next due in a couple months now. Breastfeeding didn't work for me as I had planned. With this breast pump I was still able to give my son breast milk with ease. Also on the plus side my husband got to enjoy time feeding our son as well. Comfort The comfort of the pump was great and made my pumping times quick. Ease of Cleaning Cleaning was quite easy. I did have a few times milk got into the hoses and I'd have to clean those out as well. That takes longer but still quick and only happens with user error. Durability I have used this pump a ton and it's still running like it's brand new. I also traveled multiple times adding to the abuse and it's worked perfectly every time. Versatility the versatility is pretty good with this breast pump. Ease of Use Pumping takes getting used to just as breastfeeding. Once you get used to how the pump works and how the shields fit you pumping gets very easy. I was able to get my pumping sessions fine toned in about a week so that I could get the most milk in the shortest amount of time. Perfect for the stay at home mom, or the working mom! I used this breatpump for both of my boys, now 14months and 3 years old. I am so thankful we bought this pump when my oldest son was born. It is so easy to use and definitely reduces the indimidation factor. I love that it comes with the breastmilk storage bottles and the bag with cooler. It saved me so many times! Comfort Medela has the option of different sized breast shields, if the general one doesn't fit you. Their customer service is great and the employees at the stores sure do help too! I have absolutely no complaints on the comfort! Ease of Cleaning All of the parts of this breast pump are so easy to clean! There are only 4 parts per side to worry about taking apart to clean. There are also Medela steam bags to make it even easier to sanitize your parts. I usually just used boiling water, or my bottle brush to clean everything at the end of my work day. Durability This pump has gotten me through 2 years (1 for each child) of breast feeding and pumping and still is in great condition! It is 100% worth the money! This pump comes in a handy all in one kind of bag and has been jumped on, thrown around and jumbled around in the car and you wouldn't even know by looking at it. I'm impressed! Versatility This pump more than does the job. I love my Medela pump! Ease of Use This breast pump is so easy to use. It definitely takes the anxiety out of pumping while away from your baby! I always recommend this pump to all new moms -especially working moms! I am a first time mom and I have not been able to breastfeed but just pump my milk. I had heard great reviews about this product and my doctor suggested it above any other brand. So I bought the free style machine. I love it. It does the job of pumping and at a fast rate. I like how the product has a warranty on it too. I have been using it at least 4 times a day for two months now and it has not failed me. Everything in the set is plastic and very easy to clean. It comes with an adapter, so I do not have to constantly buy batteries for it. I can hold it in one hand while multitasking and getting other things done with my other hand. The breast pump is very comfortable and the suction is good. I had wanted the best when it came down to comfort and a good suction to pull out my milk because I have to use it so often. I plan on pumping my milk until my baby is at least eight to nine months. So this pump has got to hold out strong until then. It has been great and has not failed me at all. It is much more expensive than other brands, but very worth it in the long run. It is hard to pay much for something you do not know how much you will use, but this pump is definitely worth it. It is a nice small size to carry back and forth to work or traveling. It was a bit louder than I preferred. Comfort I have no complaints on comfort. The cups fit well, and I did not experience any discomfort while pumping. Ease of Cleaning All the pieces were very easy to clean, except the tubing running to the pump. I never quite figured out how to get it good and clean. Durability My children never learned to nurse well so I used this pump exclusively for the first year of each child's life. I put a lot of hours on it, and it did well for me. By the end of the two years, it was showing some signs of losing its strength. I believe that it was more a problem of the tubing system losing some of the suction power, rather than a problem with the pump. There seemed to be a loss of seal around some of the connections, including the one that plugged in to the pump itself. 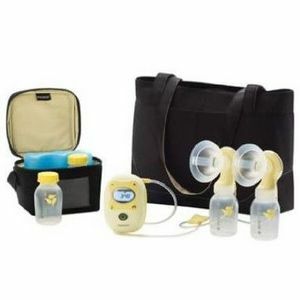 The Medela Freestyle Pump is probably the best breast pump on the market. My son is no longer using the breast pump but when I was using it, it was excellent. This breast pump is very light weight and portable. I could put it in the nice bag that came with it and go. It is quiet so you can be discreet if needed. The suction was excellent and it didn't take long to get a bottle. Overall, the breast cups are comfortable. They never caused me to be sore. Not only is it portable but is very efficient. I couldn't have asked for a better breast pump. Comfort The breast cups are smooth plastic and are very comfortable. Ease of Cleaning This pump isn't hard to clean at all. The pieces all come apart and some can go in the dishwasher. 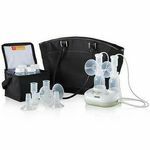 Durability This breast pump is a quality breast pump. Medela is expensive but worth every penny. The breast pump will last you as long as you need it and then some. Versatility This is the most portable quality breast pump that I have come across. It is so convenient to pop it in the nice looking bag that it came with and go. Ease of Use Simple to use. I received this pump as a gift from my mother-in-law, who understood how badly I wanted to nurse my twins. It is incredible, I love it! Easy to use, wireless means go anywhere, never wrapped up in cords! Charges easily and quickly and the suction is still strong after months and months of hard-core use! Never would have gotten through nursing without this baby. hands down, best gift I got. This was my second breast pump that I had every used. The first one I had to get rid of it because it would make my breasts so sore that I could barely move or worse I couldn't even hold my child. I had a lot of people recommend this pump set to me, making it so that I could easily do this and be comfortable at the same time. I was so impressed by the performance. The set is very easy to be carried. Easy to clean. Makes you feel at ease and not have to worry about pain after. This was deffently worth the price you pay!